ForeclosuresMass, a provider of Massachusetts foreclosure data for a fee, released its latest Massachusetts Market Analysis Report March 27, 2008, accompanied by its forecast that foreclosure filings will continue at record levels through 2008. ForeclosuresMass estimates that in 2008 Massachusetts foreclosure filings will increase by at least 15 to 25 percent above the historic highs reached in 2007. 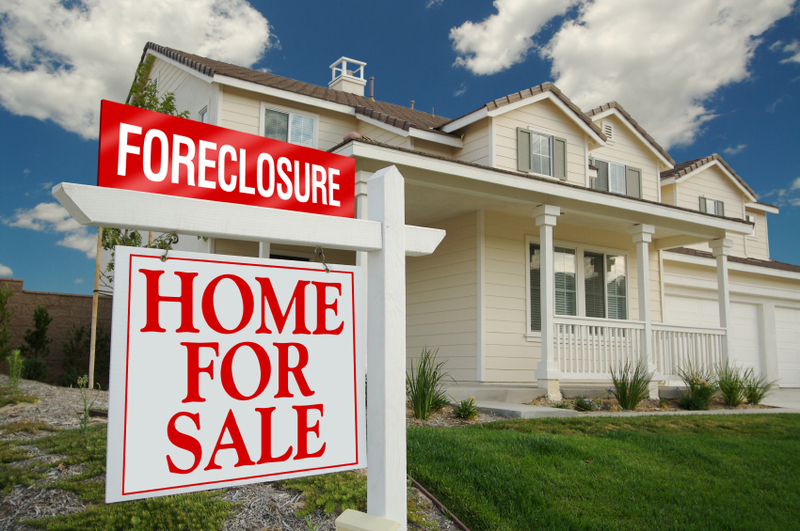 ForeclosuresMass attributes the foreclosure increase to a “perfect storm” of factors. 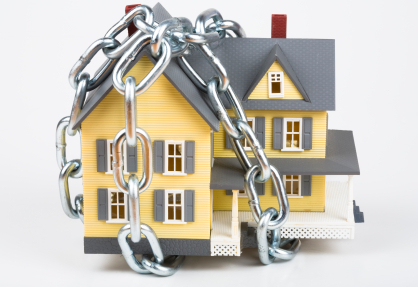 The pressures put on property owners include the effects of adjustable rate mortgages, sub-prime and other ‘exotic’ loans, the distressed lending market, decreased property values, substantially increased gasoline and home heating costs and the slumping economy. The ForeclosuresMass March 2008 Market Analysis Report shows that foreclosures are up in 282 of the state’s 351 communities, with 74 communities experiencing at least a 75 percent jump in foreclosure filings in the past 12 months. Overall, 31,516 homeowners faced foreclosure in the past 12 months, a statewide increase of 45.6 percent. Lynn, Massachusetts presently has more than 50 multi-family properties on the market for $200,000 or less. Many of these properties are owned by banks or the properties are short sales. Search for multi-family homes for $200K or less. Haverhill, Massachusetts presently has more than 35 multi-family homes on the market for $200K or less. Many of these properties are bank-owned properties or short sales. Search for multi-families in Haverhill, MA for $200K or less. According to a post on the Boston Real Estate Now Blog, about six percent of homes for sale in Massachusetts are either bank owned or short sales. The data comes from Movoto, a real estate analytics firm based in California. "The scale of the problem ranges, from 17.6 percent of homes on the market in Berkshire County to 3.6 percent in Hampden County. But the share is at least 5 percent everywhere but Hampden and Bristol counties, and it increased since January everywhere but in Hampden and Norfolk counties." Foreclosures in the United States reached an all-time high in the fourth quarter of 2007, the Boston Herald reported March 6, 2008. "The Mortgage Bankers Association, in a quarterly snapshot of the mortgage market released today, said the proportion of all mortgages nationwide that fell into foreclosure shot up to a record high of 0.83 percent in the October-to-December quarter. That surpassed the previous high of 0.78 percent set in the prior quarter." At the same time, more homeowners fell behind on their monthly mortgage payments. U.S. foreclosure activity increased 8 percent in January 2008 compared to December and shot up 57 percent compared to January 2007, RealtyTrac, a publisher of foreclosure data, reported February 26, 2008. 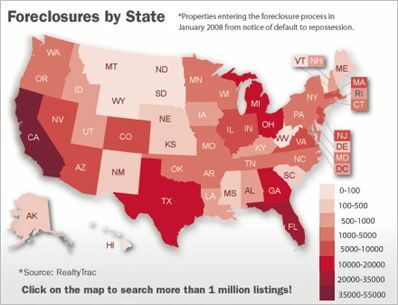 Nevada leads the U.S. in foreclosure activity. "Despite a month-over-month drop in foreclosure activity, Nevada continued to document the highest foreclosure rate among the 50 states. Foreclosure filings were reported on a total of 6,087 Nevada properties during the month, a 45 percent decrease from the previous month but still a 95 percent increase from January 2007." For January, California's foreclosure rate ranked second highest, and Florida ranked third. Other states with foreclosure rates ranking among the top 10 were Arizona, Colorado, Massachusetts, Georgia, Connecticut, Ohio and Michigan.